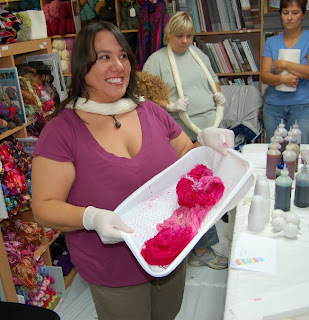 The mystery of who Cheryl was bringing was quickly ended when Missy of Wool in the Woods arrived with Cheryl to teach our hand dyeing class. 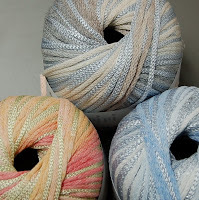 Cherry Tree Hill has completed a buyout of Wool In the Woods and will take over production of their line of hand dyed yarn. Missy took the lead in teaching the class, and I have to say she is a first rate teacher. Her technique was quite different to Cheryl's, and I thought a little easier to master if a lot messier. 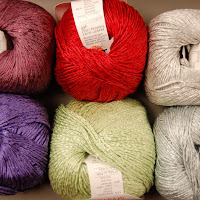 It must of felt a little strange for Missy to be dyeing Cherry Tree Hill sock yarn but she took to the task readily explaining in detail the process step by step. While Cheryl applies dye to the top of the yarn, Missy applies it generously in a pool (or well) under the yarn. After cooking in the microwave for a couple of minutes and then rinsing in cold water the squidgy mess in the tray turned into a beautiful skein of hand dyed yarn (which I now have in my possesion and will turn into a pair of socks!). Next it was the turn of the students. 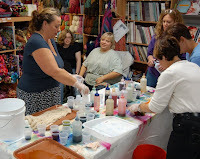 The turnout was not as good as for the last class, but the enthusiasm was there and we were eager to get our hands dyed, oh I mean yarn dyed. 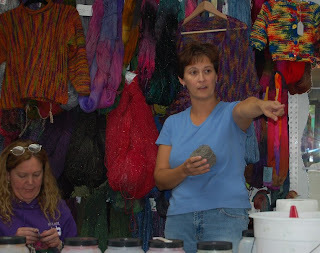 Three of us brave souls were going for the hand dyed silk lace. 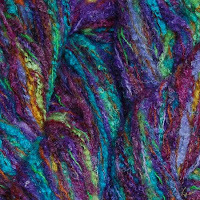 All yarns take dye differently. 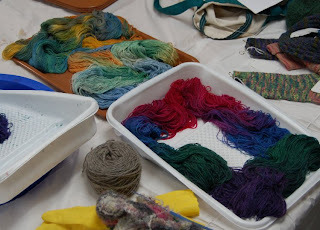 Sockittome soaks up the dye quickly, silk does not so a lot more acid must be used when dyeing silk. Our first task was to visualize our color way, and draw it out on paper in crayon. Cyndi decided to do the sock yarn first and attempt the lace later, Gina decided to do the silk first and I already had my color plan so did my silk first and then did the same color way in sockittome. Gina finished first. Her pink silk is simply amazing. 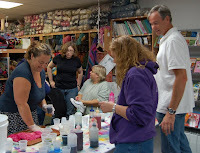 It was nice to see that everyone was able to turn out gorgeous hand dyed yarn, much credit to missy's teaching ability! 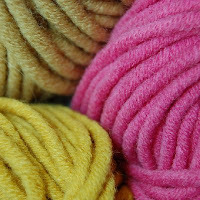 My finished skeins are the top two, the very top one is sockittome, and the lower one is silk. 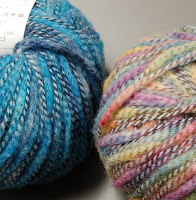 The silk came out much lighter as much dye came out in the rinse compared to the sock yarn. The color is called "Bushkill Falls" named after one of my favorive waterfalls in Pennsylvania (where Missy is from). 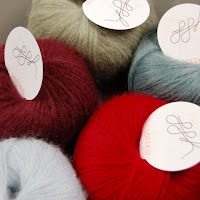 The lower skein is the very talented Hannah's amazing creation. Cool sweater huh! I designed it using Araucania Limari (70% wool, 20% alpaca and 10% silk) yarn which knits for me at 2.25 sts per inch on a US #13. This sweater knits in what feels like minutes! Plus, there are no seams - just ends to weave in..... WOW!!! It's a great man's sweater or woman's sweater (but I think I will make the woman's sweater taper at the waist a little). The pattern will be available soon at the Yarn and Fiber Company store and online. 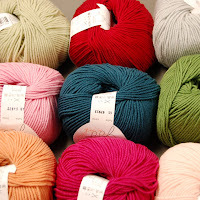 A few knitters are getting the first round of the pattern this morning to work on sweaters for their husbands - if you are interested in trying the sweater prior to the pattern being finished, the pattern is free with the yarn purchase until the pattern is finished (probably early-mid October). 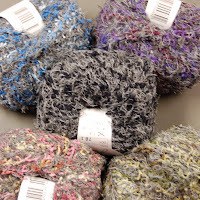 This sweater would also work up well in Big Wool, Equinox Stripes and the other bulky yarns! TIP!!!! 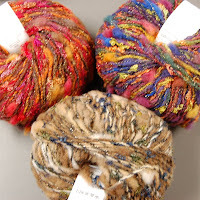 When using hand-dyed or kettle-dyed yarns.... always, always run two skeins while you are knitting and alternate the yarns either one (if on circulars) or every two rows (if using straights). 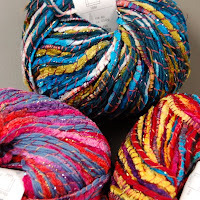 This will keep the pooling down plus, many times the shading can be completely different within the same dye-lot! 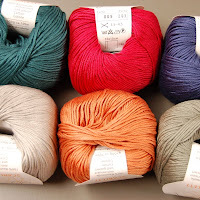 Happy knitting up hand-dyes! What's better than a yarn shop with a train? 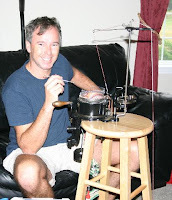 Nothing if you are a little one or the mother of one or several little ones that like yarn! Our newest addition to the yarn shop is a wonderful train table that is loved by all! Here's the scenario - four little ones (under ten years of age) came in with their mom, the littlest one was very upset that the shop puppy - Stitches - wasn't in at the moment - tears turned to instant smiles when he saw the train set....... all were happy - in fact I think Mom had to ask twice if the kids were ready to leave when she was done shopping! 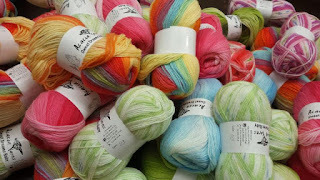 Ah, another good day at the yarn shop - even for the 2-year old! I wonderful if he will ask for Stitchie or the train when I see him next???? He's such a cutie! Check out this blanket!!!! Handmade and designed by Megan (President of the SHS Knitting Club) using Muench Big Baby! 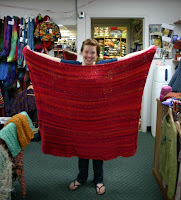 Megan used the free Big Baby Baby Blanket as her basis and made the blanket "hers" by making it bigger! We are all about making the patterns your own so that they work for your world, size, color, fiber preference, etc. The blanket only took 11 skeins of yarn and Meg claims it is perfect for wearing while doing homework or watching TV. Meg blanket is almost as beautiful as she is! 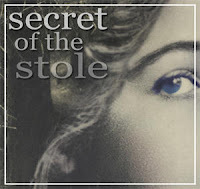 She that smile on her face, it is always there! Good job girl! Another great job is this beautiful sweater made by Teresa from Elsebeth Lavold Silky Wool - oh, and this is her first project! Amazingly gorgeous! 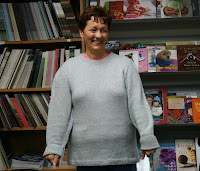 Teresa takes one of our Beyond Beginning Knitting classes run by Nancy and with Nancy's expertise and guidance, she created this gorgeous sweater. And check out the great finish work - Tonia Barry is definitely turning us all into better knitters (finishers!) with her Finishing Techniques class - Thanks Nancy and Tonia for being wonderful and talented and passing on your talents to us! And great job on the sweater Teresa! More to come soon I promise! Lots of pictures to upload and lots to write about... see you all soon!